fascinated by the sister thing. If you do have a sister (or two or three or four) you don't have to wonder. You know. Especially if you are a woman. The bonds forged between sisters can be just as dramatic, just as passionate as any romantic affair; a sister "break up" can be even more devastating than a divorce. 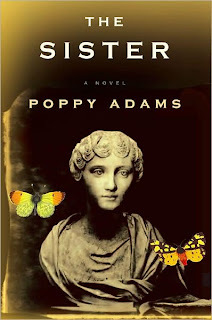 It's just this kind of strong, fiery relationship that sits at the heart of Poppy Adams' debut novel, The Sister. The story concerns 70-year-old Virginia "Ginny" Stone, a retired lepidopterist (a person who studies moths and butterflies), who is living out her life in her family's crumbling mansion. It's a solitary life Ginny leads, one that is based on routine and strict adherence to the clock. She wears two wristwatches just so she always knows the exact time. Her careful routines are about to be disrupted, she knows, so she watches her driveway with apprehension. Soon, her sister Vivien will arrive. Vivi. The sister she hasn't seen for 50 years. Vibrant Vivi sweeps into the lonely old house like the proverbial breath of fresh air. But Ginny isn't wild about fresh air. She prefers the safety of her childhood home, where everything is quiet and predictable. Inside that monument to the past she can remember her life, her family the way she wants. Vivien's presence is an intrusion, a harsh reminder that the Stone Family kept its deep, dark secrets just like everyone else. With Vivien in the house again, Ginny is jolted into the past. Her memories roam back to her childhood, years she spent happily ensconced in the laboratory with her father. Shy and withdrawn, Ginny preferred the cloistered life, where she could focus solely on her specimens. Vivien, on the other hand, resembled their mother Maud, who loved the excitement of society. While Ginny and her father toiled their lives away, happy in their seclusion, Vivi and Maud slowly deteriorated. By the time Ginny emerged from the lab, she found her life inexplicably altered - her mother had become a violent drunk and her cherished sister escaped to the city. Without Vivi to brighten their lives, The Stones followed their obsessive paths until tragedy left Ginny alone in the enormous family home. She retreated further into herself, until Vivi waltzed in a century later to open old wounds. Despite Vivi's abandonment and further insults over the years, Ginny loves her sister. The bond between them is, in fact, the only bright spot in Ginny's life. As the sisters face the reality of their past, Ginny realizes a great many truths about her parents, about her sister, and about herself. Will the truth be too much for her fragile psyche? Will Vivi cave when Ginny brings her secrets to light? Will the link between the sisters survive? Or will the past crush everything they hold dear, even the strongest of sisterly bonds? As you can tell from the plot summary, The Sister is not a light read. It's a complex psychological thriller, but not of the "can't put it down" variety. Instead, it builds slowly, chillingly, until it reaches its shocking conclusion. It's only after you've turned the last page that you realize you've been holding your breath. I know a lot of reviewers didn't like the book's ending, but I thought it made perfect sense (at least in a Ginny Stone kind of way). In fact, it was such a logical conclusion that I really wasn't that startled by it. My beefs with the book lay more in the fact that it was so dense, especially with references to lepidopterology, that I often wanted to close it. I also felt that the author left too many loose ends - I still don't quite understand why Vivi chose to come back after 50 years or what certain minor characters (like Dr. Moyse) had to do with the whole thing. Many of Adams' subplots hung in midair, never connecting to the main plot and never resolving themselves. So, while I felt that the story's ending was right (although I can't say I liked it), I didn't feel satisfied. There were just too many dots left unconnected. All that said, I ended up liking the book a lot more than I thought I would. It's an interesting read that delves into some fascinating issues. With a little polish (and a different cover - sheesh, how boring can you get? ), I think this one could really shine - at least in a dark, brooding, Victorian kind of way. The subject matter of this book really appeals to me - but both reviews I've read of it now suggest that the reader liked but not loved the book. Which reviewers didn't like the ending? Amazon-type reviewers or more 'official' reviewers? Thanks for your interesting review! I've been thinking a lot lately about sisters (and divorce). I never guessed when I was growing up that my sister would truly end up as one of my best friends in the whole world. That sounds so trite, but it's true. Do you have any other sister books you recommend a bit more, especially as a lighter read? My mom (and sisters?) have been enjoying some Jodi Picoult stuff lately. Great review that really made me feel like I'd know what to expect if I were considering whether to pick this book up or not. Tara - I was talking more about what I'd seen on book blogs. Of course, I didn't read reviews while I was reading The Sister, so it was more of a vibe I was getting. Most of the reviews I've seen suggest exactly what you said - People liked it, but not loved it. Personally, I think it needs some serious editing.